Behavior Charts! 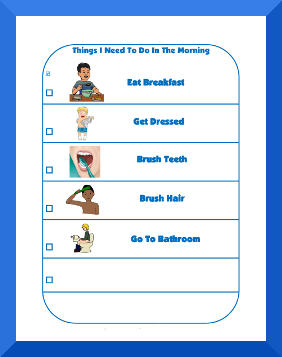 Daily routine behavior charts are effective at teaching kids organizational skills. Daily routine behavior charts work very well with younger kids and less verbal kids. If you have a chart suggestion, contact us, and we'd be happy to make it for free. You may also find some helpful behavior charts on our page of picture cards.